Perfect for teaching Fairytales to Preschool and Kindergarten age. 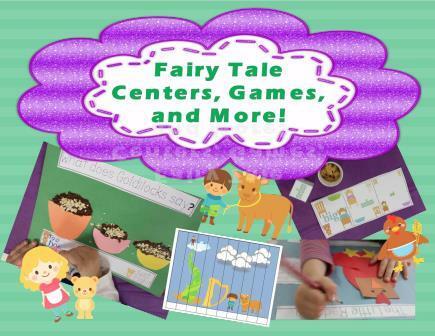 Hands-on Fairy Tale Manipulatives, Craft Templates, Games, and Take it to your seat centers for Goldilocks and the Three Bears, Jack and The Beanstalk, and The Little Red Hen. Perfect for Preschool and also could be used in Kindergarten. Please look at preview to see pictures of most of the files included in this set. Page 4 and Page 5—Three Bear Templates to print and laminate. I add a magnet on the back and show the kids how to retell the story using the pictures on a magnetic tray or board. After we retell the story as a class with the magnets, it becomes a center students can manipulate and use to retell the story. Pages 6 to 10—Goldilocks and the Three Bears craft. Directions and templates included. Tracing, small, medium, and big review. Page 11 to 13—Goldilocks and The Three Bears Big, Medium, Small game. Directions and printable dice and board included. Page 14 and 15—Goldilocks and the Three Bears activity sheet (bingo dauber needed). Page 16 to 17—Goldilocks and the Three Bears Playdough mat. Laminate before use. Pages 18 to 21—Jack and the Beanstalk Templates to print and laminate. I add a magnet on the back and show the kids how to retell the story using the pictures on a magnetic tray or board. After we retell the story as a class with the magnets, it becomes a center students can manipulate and use to retell the story. Pages 22 to 24—Templates to make a Jack and the Beanstalk craft. Page 25 to 26—Counting activity sheets with a Jack and the Beanstalk theme. Pages 27 to 29—Cut apart Puzzles. You can program page 27 with any skill you wish. I laminate these to reuse. Pages 30 to page 32—The Little Red Hen to print and laminate. I add a magnet on the back and show the kids how to retell the story using the pictures on a magnetic tray or board. After we retell the story as a class with the magnets, it becomes a center students can manipulate and use to retell the story. Pages 33 to 36—Sequencing Activities for the Little Red Hen. Page 38 and 38—Playing with the letters in red hen. Pages 39 to 44—Templates to create a Red Hen craft made from shapes. Pages 48 to 51—Patterning and matching activity (various Fairy Tales). Print on cardstock, laminate, and add velcro. These can be used as take it to your seat centers. Pages 52 to 59—Fairytale Bingo. Includes calling cards and 12 different playing cards. Fairytale characters and props used on the cards are from: The Three Little Pigs, Goldilocks and the Three Little Bears, Jack and the Beanstalk, and The Little Red Hen.